A pious festival in which married women fasts for the longevity of her husband. 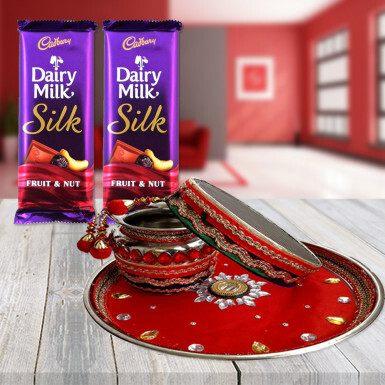 This karwa Chauth gift her this gorgeous red velvet Thali set that consist of Channi, Kalash and two Diary milk silk chocolate. Gift her this gift pack to open her fast with a wide smile as chocolates are the best reason for the smile.